Speed, options and pricing — find out which store offers better online shipping. The popularity of online retailer Amazon has skyrocketed over the last decade as brick-and-mortar businesses, including big chain retailers like Sears and Toys R Us, have seen a decline in sales and have closed stores around the country. In fact, 50 percent of American households have an Amazon Prime membership, according to a recent report from Consumer Intelligence Partners. Further proof of the growing shift from in-store buying to online shopping is in the current Fortune 500 list: Amazon has steadily climbed from the bottom — number 492 in 2002 — to number 18 in 2016. With clear profitability and a pattern of growth, it’s no wonder Walmart wants a piece of the online action. In an effort to nab some of Amazon’s growing customer base and compete with Amazon’s lightning-fast shipping speeds, Walmart recently announced that ShippingPass, the store’s membership service first introduced as a beta program in June 2015, would soon be launching as a pilot program, ShippingPass. ShippingPass isn’t available yet, but you can get on the waitlist. 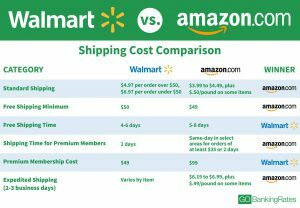 Walmart’s free value shipping, available on orders of $50 or more, was already on par with Amazon’s offering. But now the ShippingPass membership option will give Walmart an extra tool to compete with the online retail giant. Learn how the product selections, shipping options and shipping costs differ between the two retailers, and find out who offers the best value for your money. Both Amazon and Walmart offer free shipping without requiring membership. Amazon offers free shipping on eligible items that total more than $50 and Walmart offers free shipping on eligible items that total more than $49. Walmart beats Amazon on shipping times for these orders by a couple days, guaranteeing delivery between four and six days versus Amazon’s five to eight days. However, Amazon offers a lower minimum order requirement of $25 for free shipping on eligible books. When it comes to their speedy delivery membership programs, there are many similarities and a few differences between Walmart’s pilot program and Amazon’s established counterpart. First, both retailers offer free shipping — excluding membership costs — on millions of products. Second, each store now promises a two-day delivery window for members — Walmart just shaved a day off their original delivery time of three days for ShippingPass members. Walmart also reduced its annual membership price by $1, making it $49 instead of $50. In contrast, Amazon charges Prime members $99 per year. Both retailers have restrictions on what items are eligible for two-day shipping. Products eligible for Walmart’s ShippingPass are limited by inventory availability and shipping address. Furthermore, products sold and fulfilled by third parties, which include Walmart Marketplace items, do not qualify for ShippingPass. Aside from the cost difference, another distinction between the two programs is the perks they offer. Keep in mind that Walmart’s ShippingPass program is still in its beta testing phase whereas Amazon’s Prime membership has been around since 2005. Walmart has not released any information on additional perks for ShippingPass members, but Amazon offers Prime members a number of extra benefits. First, Amazon offers Prime members free same-day shipping on eligible products totaling more than $35 — if you order before noon, then you’re guaranteed to get your delivery before 9 p.m. on the same day. On Walmart.com, shipping is free if your total is more than $50 and you select value shipping. You’ll receive your items in five to seven business days. If your purchase is less than $50, the shipping rate is $4.97 per order as long as you select value shipping. Standard shipping on orders with totals under $50 is $6.97 and takes three to five business days. Standard shipping on orders with total over $50 is $4.97 and takes three to five business days. Faster shipping options — two to three business days and one to two business days — do not have set prices, but vary by item. Amazon ships orders totaling $49 or more of eligible items — or $25 if the entire order consists of books — for free. Your order will be delivered within five to eight business days after all your items are available to ship. Domestic standard shipping takes four to 14 business days and cost varies by product: from $3.99 to $4.49, plus 50 cents per pound on some items. Domestic expedited shipping takes two to six business days and cost varies by product: from $6.19 to $6.99, plus 99 cents per pound on some items. Depending on how much you shop online and your expectations for delivery speeds and extra perks, both Walmart and Amazon offer attractive features. However, the big difference between the two stores is inventory. Amazon is the clear winner in this category, offering 250 million products in contrast to Walmart’s 4.2 million products. Amazon is also more widely available, reaching 185 countries versus Walmart’s reach of just 27 countries. Variety and availability of products, along with ever-faster delivery times and Amazon’s lower free-delivery minimum for books, puts the online giant Amazon ahead of big-box retail rival Walmart in terms of delivery services. Make your purchases before the most popular toys sell out.